Cannot be Normal Summoned/Set. 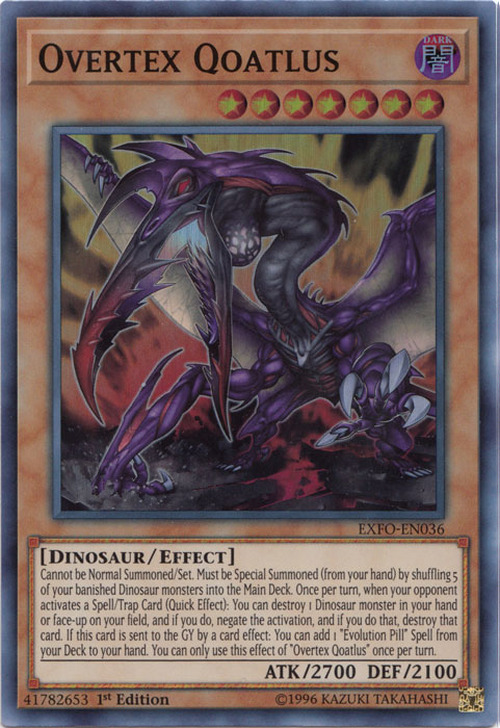 Must be Special Summoned (from your hand) by shuffling 5 of your banished Dinosaur monsters into the Main Deck. 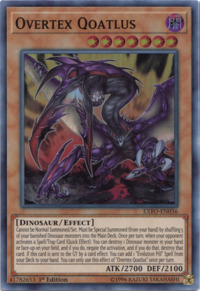 Once per turn, when your opponent activates a Spell/Trap Card (Quick Effect): You can destroy 1 Dinosaur monster in your hand or face-up on your field, and if you do, negate that activation, and if you do that, destroy that card. If this card is sent to the GY by a card effect: You can add 1 "Evolution Pill" Spell from your Deck to your hand. You can only use this effect of "Overtex Coatlus" once per turn. This card is based on Quetzalcoatlus.